And now a storage sale for the other side of Le Pond! Amazon Germany is offering the new condition 128GB Samsung EVO Plus microSDXC for 20 euro. You can buy as many as you like. This is an organic sale, not a lightning deal, so expiration unknown. It includes a full-size SD adapters. It is a UHS-I U3 Class 10 card. March 31 is World Storage Day and to sale-a-brate this day, the Amazon USA Gold Box has a big storage-themed sale featuring memory cards, hard drives, NAS, SSD, and flash drives too! This starts on Friday, the actual Black Friday! If you are a fan of the Samsung green-gray (“EVO Select”) microSD cards, their 64GB UHS-3 card has oscillated back down to $20 at Amazon by Amazon itself with up to ten per customer at the sale price. It comes with a full SD adapter. The 128GB goes for $40, and these two “defeat” the 256GB and 32GB options in this line in $/GB. Woot Plus has launched a sale on refurbished Samsung Computer Monitors. As of the time of writing, 45 models are in-stock and five of them are sold out. The sale continues until 4/16/18 or earlier for any individual models that sell out. They come with a 90-day Samsung warranty. Prices of the in-stock options range from $70 to $1500, and screen sizes range from $19″ to 75″. Free shipping for Prime members, or $5 flat shipping for non-members for everything purchased during a Woot shopping day (= the Central time zone). It has flattened to $20 again, the popular kiwi-lime (green color scheme) 64GB Samsung EVO Select microSDXC memory card (U3, Class 10), sold and shipped by Amazon itself. This is not a lightning deal, so expiration time unknown. On the lime-kiwi front, the green color scheme of the Samsung microSD cards, the EVO Select [I am giving them fruit-color names as an easier way to remember them; not sure it helps :)] in the 128GB storage option, is trapped in this convoluted sentence. Okay, it is currently down to $40 at Amazon by Amazon itself. It includes a full size SD adapter and a ten year warranty on the card storage. This is a Class 10 UHS-3. It is not a lightning deal, so expiration unknown. It “defeats” the other options (16GB to 256GB) in its line. The Mobile World Congress party is over but the Samsung Galaxy S9* party has just began! Today is the first time pre-orders are accepted for the new Snapdragon 845 duo [remember, only the S9+ gets the dual camera], with orders shipping/delivered two weeks from today (March 16). + as usual, the carriers have a variety of terms, conditions, restrictions and traps when you sign up for their installment plans, so be sure to read through it all! The Samsung S9/S9+ was officially revealed earlier today and pre-orders are scheduled for March 2nd, and they include trade-in offers if you are willing to part with your existing smartphones (at least the ones eligible for the trade-in promotions). You can reserve and be notified but the actual pre-orders will happen on March 2nd. Which may sound like it’s in the future but it’s actually Friday at 12:01am ET! Shipment and in-store availability is March 16 (two weeks later, also a Friday obviously). Best Buy has this for $40 as a daily deal but their price is destroyed by a sale from the Beach Camera group of companies. “This” refers to the 32GB Samsung PRO+ microSDHC memory card, model MB-MD32DA/AM going for $27 with free shipping by Beach through Amazon and Buydig directly and by BuyDIG’s eBay store. Meanwhile they have the 64GB version for $49 with free shipping. It is the new condition 64GB Samsung EVO Select microSD card (model MB-ME64GA/AM) on sale for $20 sold and shipped by Amazon itself. You can buy as many as you like. This is not a lightning deal. This defeats (in terms of GB/$) the other options of this line. Free shipping for Prime members or with a $25+ order. If you are a fan of the Samsung green elementproof microSD memory cards, it is the turn of the 64GB EVO Select model to be on sale, going for $20 at Amazon by Amazon itself. You can buy as many as you like (limit 30 per customer). Free shipping for Prime members or with a $25+ order. This is not a lightning deal, so expiration time unknown. It comes with a full-size SD adapter and a 10-year warranty on the memory card. To the eBay Deals we go, where for a limited time the Best Buy eBay store is offering the new condition 64GB Samsung EVO Plus microSDXC card, aka the red one, for $20 with free shipping. Limit up to three per buyer. If you are a fan of the green Samsung EVO Select microSD cards, the 128GB version is currently “defeating” the 64GB and 32GB version in $/GB, as it goes for $40 with free shipping, while the other two go for $23 and $12 respectively. It comes with a full size SD charger and 10-year warranty on the card itself. This is not a lightning deal. Up to 100MB/s & 90MB/s read & write speeds respectively; Class 10 UHS 3. These come with 4-proof protection (temperatures, water, magnetic fields, etc). Last time it was the orange-cream on sale, now it’s the kiwi-cream! It’s the 32GB green EVO Select Samsung microSD card, 95MB/s (U1),. model MB-ME32GA/AM, on sale for $10 each, in new condition and with a full size SD adapter at Amazon by Amazon itself with up to ten of them per customer at the moment. Free shipping for Prime members or with a $25+ order. Of the same line of cards, the 64GB goes for $20, the 128GB goes for $37, and the 256GB goes for $130. The orange cream is not discounted. A trio of Notebook 9 PRO laptops are eligible for FREE 27″ Samsung CF398 Curved Monitor at the Samsung website. Use your browser’s search function to search for “CF398” on that page, or slowly skim and scan the info dump to find them 🙂 The three eligible laptops range from $850 to $1200. The monitor is added automatically to your shopping cart for FREE while this promotion is running. There’s no coupon, no rebate! If you want to research the monitor, this is its product page. Do not add the monitor to the shopping cart from this page. I’m only including it for reference. If you page further down on that page, you’ll also find the PDF user manual of the monitor. As far as I can tell, only these three models are eligible for the free monitor. If you need 32GB microSD memory cards, you are in luck! The orange-cream 32GB Samsung 95MB/s (U1) MicroSD EVO Memory Card with full size SD Adapter, model MB-MP32GA/AM, is on sale for $8 at Amazon by Amazon itself with up to five per customer at the sale price. They are not “Add-On” items, so you don’t need a $25+ minimum order to buy them! Prime members get free 2-day shipping even with one card. They are not a lightning deal, so expiration time is unknown. The other two storage options are not on sale. One of the Tuesday daily deals at Best Buy is a sale on orange cream memory cards, more specifically the Samsung EVO PLUS with the 128GB going for $45, the 64GB for $25, and the 32GB for $13. The sale is also available by the Best Buy eBay store if you have eBay Bucks or Gift Cards or other PayPal promotions to use, more specifically the 64GB version and the 128GB version. Limit three per buyer. Free shipping even if you buy one memory card. There are back on sale again, these are the green soda (not the orange cream soda), it is the 128GB Samsung 100MB/s (U3) MicroSDXC EVO Select goes for $37. On the same listing, the 64GB version goes for $20, and the 32GB goes for $10. They come with a full size SD adapter. Limit up to ten per customer. These are sold and shipped by Amazon, with free shipping for Prime members or with a $25+ order. Speaking of Samsung and storage, their 500GB Samsung T5 Portable External SSD, model MU-PA500B/AM, is on sale for $150 with free shipping with up to three units per customer. It’s an orange-cream soda price match, the new condition 64GB Samsung 100MB/s (U3) MicroSD EVO Memory Card with Adapter (MB-MP64GA/AM) is going for $20 with free shipping at Walmart by Walmart itself (limit 2) and at Amazon by Amazon itself (limit 10; free Prime or $25+ shipping). It comes with a full size microSD adapter. If you are not already waiting in line for the new Samsung Galaxy S9, there are sales on the current S8 duo. The S8 goes $574 in new condition, unlocked, with USA warranty by Amazon itself (limit 2) and at B&H Photo. In a parallel sale, the larger S8+ goes for $674 in new condition, unlocked, with USA warranty at B&H Photo and by Amazon itself (limit 2). Meanwhile the Galaxy Note 8 (unlocked, USA warranty) has upticked from $780 to $800 at Amazon itself and B&H Photo. At both places, if you are surfing around the listings, make sure you are looking at the North American variant (if that’s the one you want). I was too sleepy to grab one last night, and now it’s gone, sold out and cannot be ordered as of 11/23/17 at 11am ET recheck… But wipe those tears away, other offers are running at the B&H Photo Black Friday sales.. If you love the Samsung EVO orange-cream microSD cards, it’s time to nom-nom, the new condition 128GB Samsung EVO+ UHS-I microSDXC Memory Card, model MB-MC128GA/AM, is on sale for $30 with free shipping at B&H Photo… . The cameras in smartphones keep getting better and better, they are no longer an afterthought or a marketing gimmick to lure consumers in with a bigger than the competitor megapixel number. Newer models are climbing all over each other in the DxoMark rankings. (as usual, it should go without saying, the Dxomark measurement are only one part of the equation, benchmarks are never the whole answer). The Orchid Gray version of the Samsung Galaxy Note 8 is now down to $908~ at Amazon by Amazon itself. That’s the lowest I’ve seen it there for the US warranty, US unlocked version. Meanwhile the Essential Phone by Android’s Andy Rubin is down to $450 again in either color scheme. Note that the 64GB version of the Moto G5 Plus has 4GB of RAM (instead of 2GB), that’s part of the price difference, sale or no sale. As with previous generations, these are “all carrier” phones, they work on all four major US carriers. Flagship time! Hide your wallets! The new condition factory-unlocked USA version with USA warranty of the Samsung Galaxy Note 8 smartphone flagship with dual OIS back cameras, in the Orchid Gray color scheme, is, as of the time of writing, in-stock and ready to ship to your front door for $950 at Amazon by Amazon itself. The other color (“Midnight Black”) is only in-stock by 3rd-party sellers. But that’s not all. If “Orchid Gray” is not your thing, and you are comfortable with International Variants (not the US model with US warranty but compatible with some GSM carriers – check carrier and frequencies before buying), the “Maple Gold” is in-stock for $950 at B&H Photo, while the “Midnight Black” goes for $1000. These are International versions! 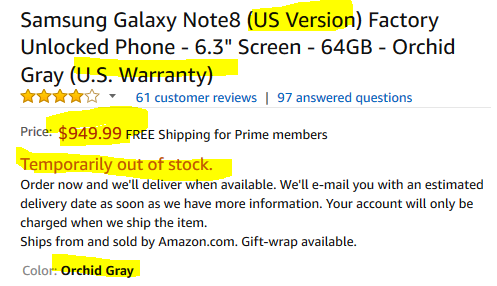 The US version with US warranty, factory unlocked, of the Samsung Galaxy Note 8 flagship smartphone with its dual OIS back cameras, in the Orchid Gray color scheme is now at the all-encompassing “Temporarily out of stock” status at Amazon, sold and shipped by Amazon itself. This is a step in the right direction (over Pre-Order status without a date) but still not a concrete date. But it’s getting there! Meanwhile the B&H Photo listings remain in “New Item – Coming Soon” condition. Note that the B&H page has a mix of North American and International variants, so make sure you are looking at the correct model you are interested in. Speaking of flagships, the Essential Phone is now down to $599 (from $699) in both color schemes, in the new condition factory unlocked with USA warranty model. This if you want an uber flagship smartphone. If not, for the same price, you can buy 3-4 units of the Moto G5 Plus with “all carrier” support (the Big Four in the US market) for $240 with Prime Lockscreen Ads or for $300 Factory Unlocked. Note [no pun intended] that the $185/$235 model is with 2GB RAM / 32GB storage, while this $240/$300 model is with 4GB RAM / 64GB storage. The extra RAM is more important, especially if you plan on keeping/using the phone throughout its lifecycle, since apps get more and more bloated as time goes by (even if you don’t upgrade to a newer OS version). The new condition Samsung Gear 360 VR is now down to $89 with free shipping and handling, sold by various 3rd-parties sellers with the orders fulfilled by Amazon, so you get free 2-day Prime shipping if a member. It averages 3.6 out of 5 based on 270+ customer reviews and has almost 200 answered questions. If you are a fan of the Samsung EVO Select U3 microSDXC cards, they are currently on sale at amazon.com. The 64GB version goes for $23, while the 32GB version goes for $13, and the 128GB goes for $45. This is the card with SD adapter option. The option with the card readers go for more. Per the Mobile OS Fairness Doctrine, having mentioned the new iPhones, we now have to mention the flagship Android phone with its dual OIS cameras, which, what a coincidence, is also available for pre-order! If you prefer factory unlocked, with USA warranty and no carrier strings attached, you can get it for $930 in two color options at B&H Photo and Amazon itself. Samsung’s own store offers it both factory unlocked, and also in six carrier configurations (the Big Four, plus US Cellular and Comcast/Xfinity) for $930. 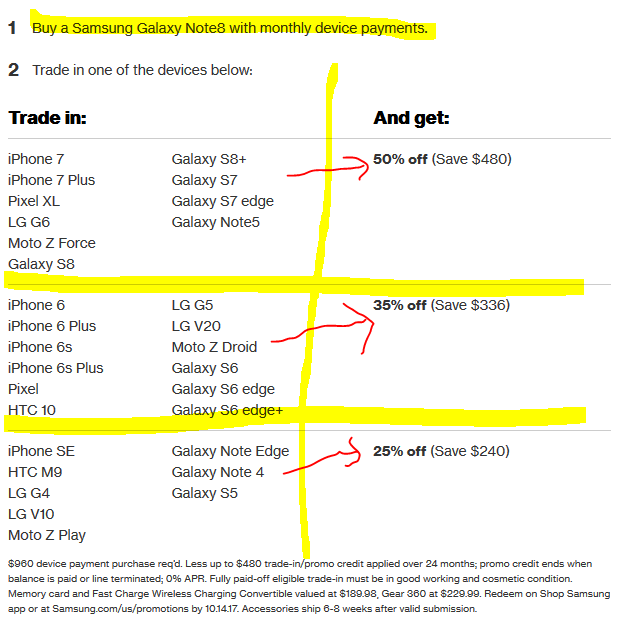 They also have an optional $300 Trade-In Promotion of qualifying/eligible trade-in phones. UPDATE: if you are a fan of eBay shopping, they have a variety of listings. Keep in mind, eBay is an open marketplace with all kinds of product conditions and authorized dealer status and international models and such, so be sure to scrutinize each listing before buying! There are also some promotions that get you free accessories with early pre-orders. Check each carrier’s various options for details. AT&T offers a 30-month installment plan with 0% APR on approved credit and such, for $31.67 per month. They have an up to $300 trade-in promotion, fineprint buried at the bottom of that page. T-Mobile offers an old fashioned “Buy One, Get One FREE” promotion, with their own set of prerequisites and requirements for the promotion. SPRINT has a “Switch to Sprint” promotion that is $20 per month on the 18-month Sprint FLEX Lease program with monthly bill credits on approved credit, with their prerequisites and restrictions. Note that this is a lease promotion, not a purchase promotion. Verizon Wireless has a Trade-IN promotion that gets you up to 50% off Galaxy Note 8 with select trade-ins and a monthly payment plan and with other requirements. The 50% off is reserved for ten models (S7*, S8*, iPhone 7*, Pixel XL, etc), while the 35% off is with previous previous generation flagships, and 25% off is three times previous generation models. SSD time once again because the data must flow, and flow, and faster and faster it must flow 😉 The new condition Samsung 850 PRO series of Internal SATA III 2.5-inch SSDs is on sale in the various storage denominations at Amazon by Amazon itself with a limit of up to three units per storage option per customer. The 256GB goes for $120, the 512GB for $212, the 1TB for $421, and the 2TB for $898. Each one also has an option to come bundled with a Mount Bundle for +$7. Speaking of storage, the new condition 64GB Samsung EVO Select U3 microSDXC memory card, model MB-ME64GA/AM, is back on sale for $23, in new condition at Amazon by Amazon itself. Meanwhile the 128GB version goes for $45. If you need additional items to get free shipping (non-Prime members), check our previous AmazonBasics posts. If you are a fan of state of the art really-really wide monitors, the new 49″ Samsung 32:9 Curved 4K 144 Hz FreeSync HDR LCD Monitor is now available for pre-ordering for $1500 with free expedited shipping at B&H Photo with a late July 2017 release estimate. Speaking of Samsung, their Samsung Gear 360 VR camera is on sale for $110 with free shipping with up to three units per customer. This is the US version with US warranty.